The head of the Jerusalem Orthodox Church told about it at his meeting with the Ukrainian delegation, Andrey Lozovoy, deputy head of Oleg Lyashko’s radical faction in the Supreme Rada writes about it in his blog at theKorresponsent.net website. He writes that his colleague and he were unpleasantly surprised when they heard Theophilus’ speech. “We consider Russians and Ukrainians one people,” “our lost brothers headed by Filaret fell apart from Mother-Church,” “the most important for you is to reconcile with the Russian people,” “we have very good relations with your Metropolitan Onufry,” Lozovoy quotes these abstracts from the Jerusalem Patriarch’s speech. According to the deputy, he just wanted to “stand up and leave.” Members of the Ukrainian delegation tried to make the Patriarch change his mind. They said they were not satisfied with UOC head Metropolitan Onufry’s actions, who refused to stand up in order to commemorate soldiers of the Ukrainian Army killed in ATO operation. “It is hard to say if the Jerusalem Patriarch heard us,” Lozovoy resumes. 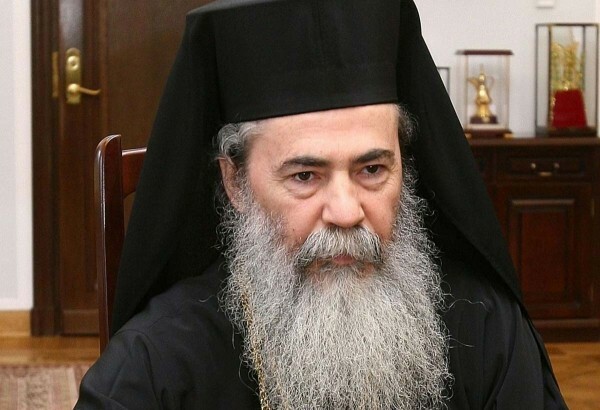 The publication recalls that the Jerusalem patriarch has exclusive right to receive the Easter Holy Fire, which Orthodox Christians consider to be a miracle.